​​​​​​ HOUSTON – Hertz Investment Group purchased Westchase Park Plaza, a ten-story office building at 11490 Westheimer, from Miami-based Parmenter. The company paid $24 million for the 23​​2,108-sf building. The property, which recently underwent a multimillion-dollar renovation, is 60 pe​rcent leased. Richland Cos. has acquired a 74,462-sf industrial flex property at 8100 Westpark Dr. from Big Houston SW. The pro​perty is fully leased to Hoffer Furniture, Pak Man Supply and DragoArt Tattoo​ Supply. 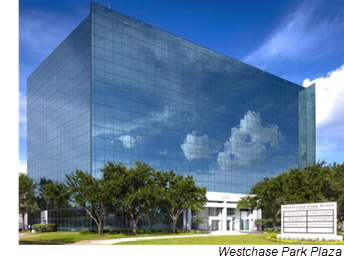 ​​Check out Houston-The Woodlands-Sugar Land Office Market Research.